This is the ultimate presentation of The New Tradition. For this option, The New Tradition will be printed on inkjet paper (using a 10-colour Epson printer), resulting in exhibition print quality for EVERY photograph in the book. It will be like looking at original photographs every time you turn the page. And this is the version of the book Peter has in his own library. We realise it's not cheap. The raw cost of having the book hand-printed and bound by MomentoPro is significant, but this is what's required to maximise the production values for this publication. You cannot get a better quality output - and the book will be signed by Peter as well. The inkjet edition is limited to 45 books. The book will come presented in its own presentation box and a standard offset version of the book will also be provided. This option also includes a 30-inch print and you can choose any of the 100 feature photographs in The New Tradition, so you can order now (if you already have a favourite photograph) or wait until you receive the book, review your options and then place an order later on. The choice is yours! 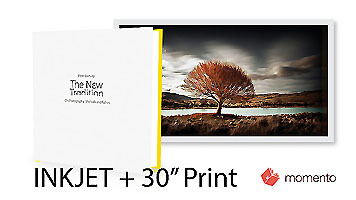 Your selected image will be printed on Canson Infinity Rag Photographique paper using an Epson SureColor P10070. The image will be signed, include a generous white border and is supplied unframed. Some of these photographs are part-way through existing editions, so the number of available prints for this offer is limited to the edition number.